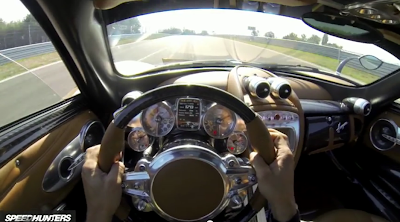 So, this is probably how the 99,9% of us will get to experience so close the feel to be in the driving seat of the Pagani Huayra! This spectacular first view video shows us Pagani's chief test driver Davide Testi behind the wheel of Pagani's factory Huayra (refreshed with a new golden wrap) being driven like no other could do on track! The gorgeous sound coming out the V12 and the turbos mixed with the proper driving skills make this a very enjoyable video to watch! It's not necessary to let the turbo cool down before he turns off the engine. Anonymous, why do you talk to yourself?